We have been talking with photographer Peter Dench about running a documentary photography workshop. The workshop will be very social, with Peter showing us how he tackles capturing the everyday. It will be aimed at all skill levels, more about taking the photo, of seeing opportunities to document people at play, at their leisure time. The session will be to encourage people’s interest, and to add a photographic element to the archive, so participants to the workshop would have to agree for their photos to end up in our archive. We’d touch on the aspect of capturing metadata, of adding context to the photos. Peter’s photographic reputation rests upon his ability to take gritty, humorous and reflective photography of every day events, landscapes and people. Peter achieved a World Press Photo Award in the People in the News category, participated in the World Press Joop Masterclass and joined Reportage by Getty Images in 2012. His solo exhibitions include ‘LoveUK’ in Cardiff, UK and England. 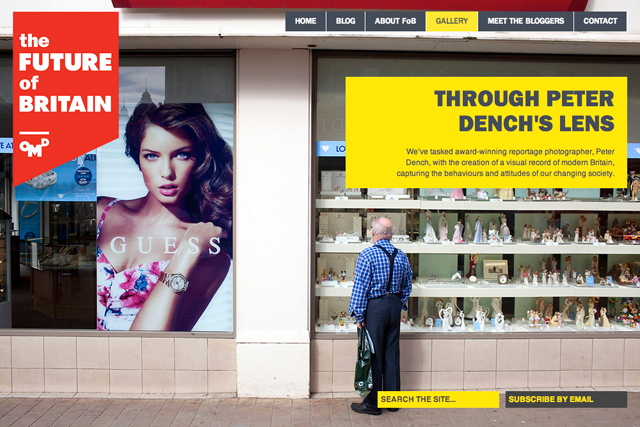 For our research, we’ve charged Peter’s lens with revealing the behaviours and attitudes of modern Britain.